Why and How I made this? Z-19 rev 1.7 --Creality mod by Dan_W_58 is licensed under the Creative Commons - Attribution - Non-Commercial - Share Alike license. 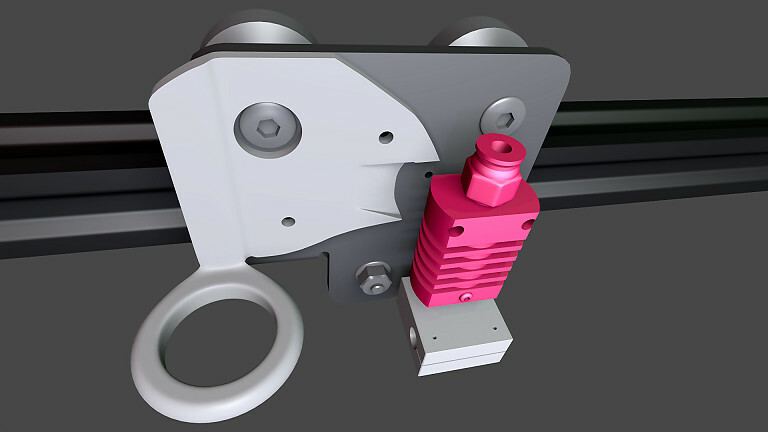 UPDATE AUGUST 31, 2018: Uploaded an experimental new revision of the BLtouch holding bracket. The file is named "BracketBLTOUCH_rev1.7C.stl", and I have not tested it. It addresses two problems with rev 1.7: Collision with the X axis motor, and excessive height. The STL contains a number of printed spacers or gaskts going by fibbonacci multiples of 0.1mm: 0.5, 0.8, 1.3, 2.1, 3.4 and 5.5 mm thickness. They can be combined to obtain many other thicknesses. It's a very tight fit. The bracket was colliding with the Z-19, so I did the quickest solution I could think of: I subtracted the Z-19 from the bracket (boolean operation), so there's like a chunk missing and you might think it's your printer malfunctioning. No, it's how it has to be for now. UPDATE AUGUST 23, 2018: The BLtouch sensor bracket is wrongly dimensioned. I'm working on a fix. Mounting base at the back and on the left side "raised" by 2 mm to allow various custom brackets for auto bed-leveling sensors to mount onto the back plate and be secured by the same screws that hold the Z-19. NOTE: The two original case mounting screws, 3x6 mm are no longer long enough, as of revision 1.7; they need to be replaced with 3x8 mm screws. Separate STL files for three popular brackets, including: TH3D EZABL 12mm, TH3D EZABL 18mm, and BLtouch sensors, plus a dummy bracket to use when no sensor holder is present. This is a printable replacement for the printing head housing (square, or rather cubic, metal housing) that comes stock with the Creality CR-10 and CR-10S, mini, Ender 2 and 3 and many other, if not all, Creality 3D printers. It was inspired by the famous "OEM Fang Mod", and like the Fang Mod it allows better viewing of the printing in progress. But the Z-19 mod differs from the Fang Mod in many ways, some of them very important, such as improving the cooling by taking basic --but somewhat counter-intuitive-- rules of aerodynamics into account (read more about this below), and by improving mounting ruggedness. Installation is pretty simple. 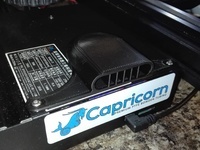 No cutting, drilling or soldering are required; this mod uses the same fans and hot end as the original; it is a plug and play replacement for the metal housing. All you need is allen keys, and a cutter or razor blade to strip a loop of insulating tape, just to loosen the fan wires a bit. Detailed installation instructions provided further below. UPDATE: As of revision 1.61, you need to buy 3x8 mm screws to replace the two 3x6 mm screws that hold the box to the back plate. Also, someone reported having trouble with the hot-end mounting screws not reaching the threads in the inserts. I don't understand how that's possible, but it might be prudent to get 3x20 mm screws to replace those 3x18 mm, should it prove necessary. Finally, if you intend to replace the main fan by a 40x40x20 mm fan, which I highly recommend, you will need three 3x22 mm screws. Not all hardware stores stock millimetric screws with allen key heads. Use your phone before you hop on the motorbike. The Z-19 is meant to be an entry level modding fang thing, easy to print, then swap out the box and in the print, no cutting or soldering; no new parts to order; only some screws you'll need to replace.﻿ 11 hours of printing; optional painting; then 15~30 minutes installation. Offers better view of the printing than the original metal box, much like the OEM Fang mod does. Unlike the OEM Fang mod, it Is compatible with the Micro-Swiss All Metal Hot End. 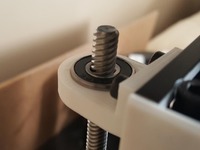 Better mounting: uses the two original mounting screws AND the two screws for the hot end; plus it has multiple contact points against the back plate, for a very solid, non-shifty, non-vibrational attachment. I believe the Z-19 delivers better cooling than the original (metal) housing design; but I cannot make a categorical claim about this, as I don't have the equipment to verify it. Certainly much better cooling than the OEM Fang Mod. Designed in Blender, painstakingly avoiding triangles (better than 90% quads), for smoothing subdivision -friendliness, and to be easy to work with and maintain. It prints as a single object --in one piece; no parts to assemble, except for the customizable bed leveling sensor holding brackets. The STL file is a single, closed solid (a continuous, closed manifold), without cracks or holes, duplicated vertices, dangling edges, loose geometry, flipped normals, overlapping facets, inter-penetrations, or any such common mesh flaws. There is absolutely nothing for the slicer apps to plug, heal or fix. Allows swapping of a 40x40x20 mm muffin fan for the 40x40x10 original. Allows a customizable bracket to be inserted to hold an auto-bed-leveling (ABL) sensor. If you have a Creality (any model), I believe you can use my gcode for PLA. It is generated using Simplify 3D, and I've been working hard at optimizing all parameters. The printing time I've also managed to cut down from 21 hours for rev1.0 to 15 hours for rev1.3, and 11 hours for revision 1.5. So try to use my gcode, if at all possible. However, you may have to manually override the temperatures, if printing with a material other than plain PLA. The temperatures I've set in the gcode file are 205 degrees C for nozzle and 60C for bed. For Sunlu PLA+, for example, you'd go to Control -> Temperature (as printing starts) and override bed temperature to 40C and nozzle temperature to 215C. You need to set supports to "from build bed only". If you allow your slicer to build supports on top of model surfaces, it will probably build supports inside the air ducts, and you'll never be able to get them out. 3 perimeters will work out better than 2, as most of the walls are thin enough that with 3 perimeters there's nothing left to fill, thus avoiding all the vibration and noise. UPDATE: I'm going back to 2 perimeters. The reason is that when thin walls are made of ONLY perimeters, they tend to crack along the printing lines like wood cracks along the fibers. The good thing about infill (excluding honeycomb, which is no good, IMO) is that the angle changes at each layer, forming a criss-cross pattern that's quite rigid. My last gcode, 1.3, was made of 3 perimeters and 20% infill. This is not very strong at all. I'm going back to 2 perimeters and 50% infill (rectilinear). UPDATE: Eventually went back to 100% infill, as of revision 1.5. Also, I recommend using a nice, wide brim. I use a 2-layer, 10-perimeter brim. This holds the supports really well, I find. As of revision 1.3, the first thing you need to do after printing, before even trying to pop the print off the build bed, is to use a small, flat screwdriver to crack some model-support interfaces. Particularly the manual support under the main fan, with like a crenelated ring. (See the second picture below.) Be sure it is cracked all around. The reason for this is that the cylindrical structure is strong, and it could pull too hard from the grill when trying to lift the model from the bed. But feel free to use the screwdriver on other model/support interfaces. Just insert screwdriver in an interface, and turn it until you hear a pop. That's all. It will make the whole cleaning process easier. The reason why I have a manually design support structure there is that even Simplify 3D, the slicer I have, which probably builds the best supports of any slicer program out there, couldn't do it. Too narrow spaces for the supports to pass through. The red highlighted features in the first picture below are the structures that need removing, besides the slicer-generated supports, of course. Once all the generated supports are removed, you should spend some time scraping off any hairs, blobs or support structure barbs and cling-ons. (Be very gentle when scraping the wires of the fan grill; they are as fragile as they look). Then I paint it. You may choose not to. I prefer to paint it because most printing materials absorb humidity. 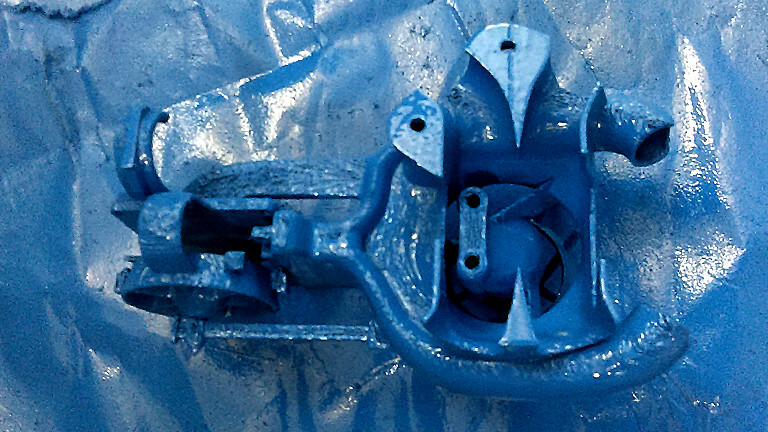 This is a functional part, and I feel it is better protected with a coat or two of glossy, anti-rust spray paint, and looks a lot nicer, too. Besides the slicer-generated supports, these manually designed supports need to be removed also. Be sure to crack the support interface BEFORE attempting to pop model from build plate. 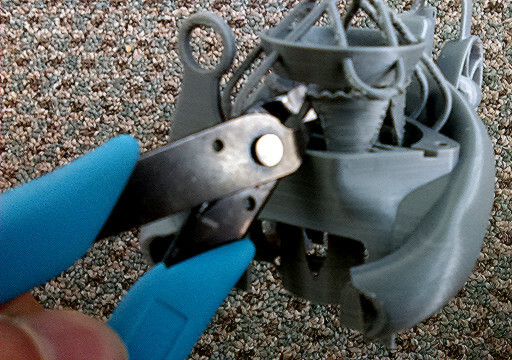 After removing slicer-generated supports, you'll be left with this loose support cylinder. ... as there are convenient spots along the lower end; but the endeavor may necessitate creativity, patience, perseverence, wisdom, and other virtues. ...and I flip it over, to paint the front. The front I paint more carefully. Half hour later, I set it upright and give it one last spray. 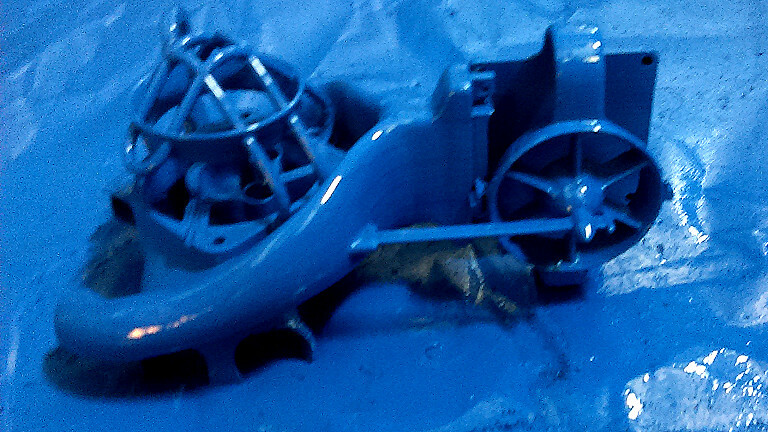 After printing this Thing, and after painting it if you want to paint it, you'll need to spend some time installing it. You don't need to remove the extruder tube, or even the filament, --unless you are cleaning up the hot end, or upgrading, at the same time. 1) Remove the original housing, the sheet metal cubic box, which is attached to the print head plate with two screws. To remove those screws you need a millimetric Allen key: 2 mm. Note that the Allen keys that come with the printer, for assembly, are imperial; not metric. Don't lose the screws; put them in a box; you'll need them again. 2) The fans are attached to the metal box; you need to remove the screws and remove the fans. Memorize or write down which screws are for what. 3) Then you need to detach the hot end + nozzle assembly from the print head plate, by removing the two screws that hold it in place. Note the threaded inserts/spacers that those screws screw into. 5) Put the hot end assembly into the Z19. Note that there's a space for heater block wires, but so, the side of those wires ("right side", if looking from the front) goes in first; then the assembly. Line up the two holes at the top of the hot end cooling block to the screws you just pushed through. 6) Push the screws with a screwdriver, again, until they come out of the other side of the hot end's cooling block. 7) If you have a Micro-Swiss hot end, before mounting our hot end assembly + Z-19 to the back plate, you should wrap the silicone sock around the heater block. Proximity of the block to the plate makes this difficult afterwards. 8) Now the whole thing mounts onto the print head back-plate. Line up the screws to the inserts on the plate, and screw them in. Don't tighten the two screws yet, however; leave them a bit loose, as there are two more mounting screws to line up and screw in, on the left side. 9) You'll need to drop the screws that originally held the metal housing into the two screw tubes on the left side (one shallow; one deep). Push them through with a screw-driver, and jiggle the Z-19 around until the screws go into the threaded holes in the metal plate. The fans will be a bit tricky because the wires are not long enough when held together by those shrink tubes and sleeving; you may have to cut off a bit of the outer sleeve to liberate enough wire length. 10) The muffin fan slides from the bottom right, under the fan grill (see the pictures). Note a squarish thin canal on the fan base in the Z-19; it corresponds to where the fan itself has a canal for its wires. This will help you identify the correct orientation of the fan. Orientation is critical to minimize pulling on the wires, as well as for air-flow. 11) Three of the original screws (one of the original four won't be used) need to be dropped into the screw guides in the fan, and they screw into under-sized holes in the Z-19, in self-tapping fashion. 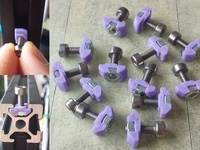 However, these are not self-tapping screws, and the Z-19 is printed in plastic (PLA, Nylon or whatever) and so you have to be very careful and gentle. As soon as you feel the slightest increase in resistance, stop tightening, or you'll strip the plastic. 12) The centrifugal fan goes at the top. It slides in between the square back and the fan grill, and "plugs" into the rectangular end of the air ducts. Needs a bit of pushing down with a thumb to insert fully. 13) Once it lines up with the screw-holes, insert the four original screws (the two shorter ones at the top; the two longer ones at the bottom). 14) Turn power on. The muffin fan should come on right away. If it is blocked or very noisy, it is probably because the screws are not tight enough and it touches the grill. Verify that air comes out the vents on the sides; --just a slight breeze; don't expect "wind". UPDATE: As of revision 1.6, you need to buy 3x8 mm screws to replace the two 3x6 mm screws that hold the box to the back plate. Also, someone reported having trouble with the hot-end mounting screws. I don't understand how that's possible, but it might be prudent to get 3x20 mm screws to replace those 3x18 mm, should it be necessary. Lastly, if you intend to replace the main fan by a 40x40x20 mm fan, which I highly recommend, you will need three 3x22 mm screws. Not all hardware stores stock millimetric screws. Use your phone. I have no experience making videos; if someone would care to make one on how to install this thing, I will link to it from here. Thanks in advance. The stl file I upload is a two-level surface subdivision version (roughly 16x the number of polygons), for extra smoothness; but that makes it very hard to work with in a 3D app. If you wish to play with the original 3D file, you can message me: give me your email, and what format you wish it in. The best format for you would be .blend, if you can use it, as Blender has layers, and the objects used for its construction (for boolean operations and all that) are right there in other layers; but exporting to another format will mix everything. If the .blend format is okay with you, it's already uploaded; it's the file with the extension ".blend". I designed this after I printed (and was disappointed with) the Fang Mod (actually, that was not the original "OEM Fang CR-10", but rather an upgrade which shortened the fangs a little bit; the "High Clearance CR10 OEM Fang Mod" to be precise); and I wanted to improve on it, drastically. But the mesh, or at least the STL file mesh, was difficult to work with (all triangles; gazillions of them), so I started a new project from scratch, in Blender 3D. 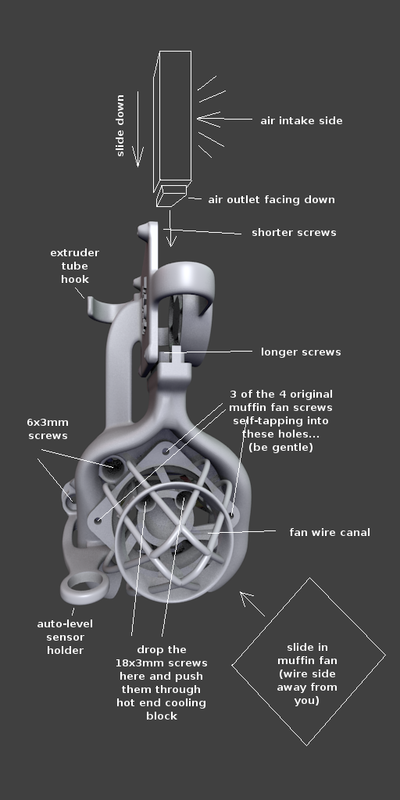 The first incarnation improved the air flow (over the Fang Mod) for the centrifugal fan, but the muffin fan that cools the hot end remained still too obstructed. So I started again from scratch, and this (revision 1) is the first working model. 2) The flow had to split into two tubes, so, next to the rectangle above, on the same plane, I drew a rectangle of the same length but half the width. 3) On the same plane, some distance to the side, I built a circle of a radius calculated to give it the same area as the rectangle in point (2) above. 4) Between these two shapes, still in the same plane, half way in-between, I built an ellipse with a length to width ratio approximately equal to the square root of the length to width ratio of the rectangle, but with the same area as the rectangle and the circle. 5) Between the rectangle and the ellipse I drew a thinner but rounded rectangle, also of the same area, but with a length to width ratio between the rectangle and the ellipse, and the same area. 6) Between the ellipse and the circle, I built a fatter and shorter ellipse also of the same area. 7) In-between the 5 objects above, I built another 4 intermediate shapes, always the same area. 12) Used Blender's "Solidify" attribute to give thickness to these tubes. A similar process applied to designing the air ducts around the hot end. First I calculated the total area of air flow openings in the muffin fan, and then tried to maintain that same cross section area as the conduit flowed around the hot end, then out the sides. I wish I had saved screenshots of the process. I struggled with the question of what to name this Thing... Until a couple of weeks ago it hit me that it kind of resembled a helicopter, to my eyes, anyways; so I first thought of naming it "Apache" ... but then I figured that a Chinese 3D printer manufacturer might not appreciate a mod for their printer named after an American helicopter; so I searched the Internet for Chinese helicopters, and I found that the Harbin Z-9 and Z-19 would be the ones this Thing would be most reminiscent of. And, of the two, the Z-19 is an all-Chinese helicopter, designed in China from the ground up, --unlike its predecessor, the Z-9, which was a licensed replica of some Eurocopter model. So, Z-19 it was, I decided. You can read about it in Wikipedia. So far no one has reported making this. I've been meaning to upload a gcode version. 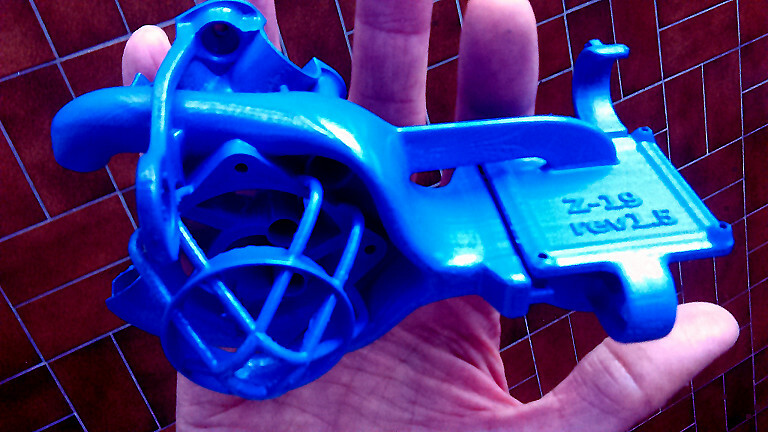 It will be a boon for people using Cura, Slic3r, etc., as I happen to have Simplify 3D, which does a much better job of avoiding stringing than any other slicer I tried before, and makes much better supports (more supportive, and yet easier to remove). The reason I bought it was precisely because after downloading a few things in gcode format that had been sliced with Simplify, and seeing how well they printed, I realized I was missing something. Some time ago I had a falling out with PLA (hated the dimensional instability of it) and after a lot of research decided that the material I really wanted to print with was ePA-CF (nylon with carbon fiber). But to print that, I needed to upgrade the hot end; and I would need an abrasion resistant nozzle, too. So I spent over $200 Canadian to buy the MicroSwiss All Metal hot end and The Olsson Ruby Nozzle, plus a roll of ePA-CF. I got a few test prints done, but they were brittle; --nowhere nearly as strong as my PLA prints had been, even though ePA-CF is supposed to be super-strong. Plus, I had poor adhesion, AND a lot of stringing, and a lot of nozzle catching its own strings and getting dirty. I was printing multiple copies of a string test model with different settings for retraction, coasting distance and whatnot, and was gradually improving things, when the first heat brake clog happened. I had to take the hot end apart and clean out the titanium heat brake with a blowtorch (nothing dissolves nylon, pretty much). Three prints after that, it happened again. The third time it happened, I accidentally broke the ruby tip of the Olsson Ruby Nozzle. There went $125, in the blink of an eye. I will never buy it again; needless to say. For that price I can buy a dozen carbon steel nozzles that will take a year each to wear out; and steel doesn't shatter like ruby does. I blamed the ePA-CF material, and finally decided to give up on it. I cleaned the hot end, then reassembled it, and this time I fed it good old PLA filament; and started a print job that had been waiting for weeks already. Then the inconceivable happened: I got a clog. Tried extruding manually, but it didn't clear it. Tried to pull the PLA filament back, but it refused. I raised the nozzle temperature way above PLA temperatures, all the way to 270, to see if that would allow me to pull the filament back and out; but it didn't work. 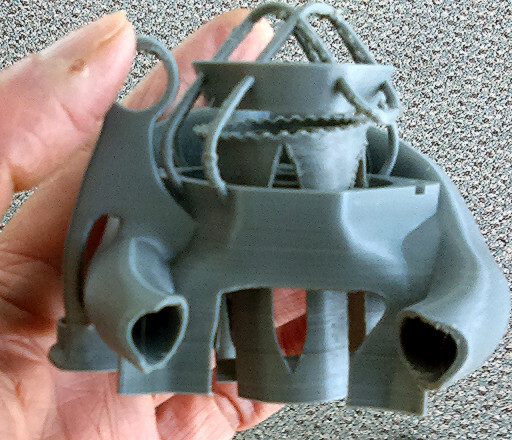 So I took the printing assembly apart yet again, and, to my amazement, the nozzle AND heat brake came out easily.... The PLA fiber was actually stuck to the cooling block, this time. It still is, in fact; the Micro Swiss All Metal Hot End's cooling block is officially hanging from the foot long chunk of PLA filament that got stuck to it, --against a wall in my office, serving as "decoration", and as a reminder never to buy anything Micro Swiss ever again. So, as of yesterday evening I'm back to the original hot end that came with the CR-10S. and back to PLA. Thinking of trying PETG, perhaps, but not now, and not too soon. I'm writing all this while letting the shock pass. Not good when things like this happen after working all night, not having slept at all, and having run out of vitamins.... I'm going home to sleep. Long weekend here; but I won't be coming to work; got other commitments. The printer is fixed, and busy with stuff for my day-job for now. If it finishes what it's doing before I leave, I'll get a Z-19 printout started; otherwise I'll come to work in the weekend and do it. Should have the gcode validated and uploaded by Monday. Revision 1.1 is tentatively finished. Strengthened the "wires" of the fan grill about 20% thicker as they come out of the base; and added ribs along the front and back of the square platform the top fan screws into, to reinforce it --as the square broke in half on me as I was trying to get the print off the print-bed. I will start a new print before I leave to go home. Hopefully tomorrow I will upload the Z-19_rev1.1.STL AND a gcode file to go with it. Flow control was set at 110%; I put it back to 100%. Retraction: Raised it from 5 mm to 6 mm. Coasting: Increased from 0.4 mm to 1 mm. Hopefully the above will get rid of hairs. Also, max overhang: raised it from 50 deg to 55 deg. Support infill: lowered it from its 40% default to 30%. Some unnecessary supports disappeared, and the rest are a bit more spaced; not so dense. I think it will be much easier to clean the thing, now. So far the first 10 or so layers are looking good. 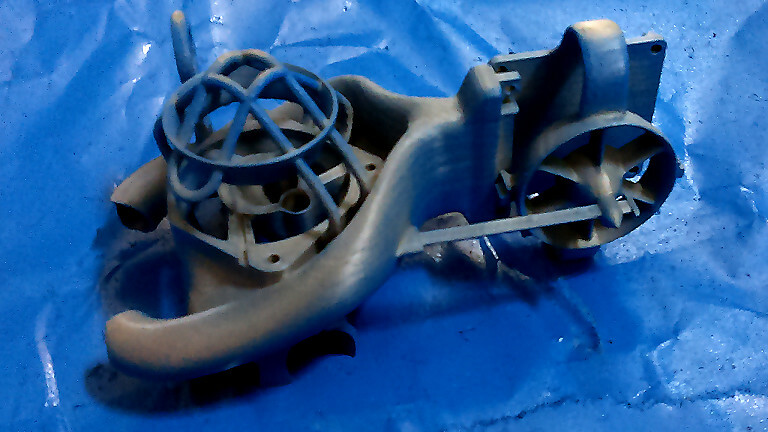 Z-19 rev1.1 is about 50% printed. I just added a picture of it. There's no hairs at all; very, very clean print. Still, to err on the side of caution, I will resist the temptation to upload files until it is done and installed. Possibly tonight, and if not tomorrow for sure. Done. Revision 1.1 is uploaded, including gcode file for CR-10 (parameterized for PLA), --sliced with Simplify 3D. I installed rev 1.1 and noticed that the 3 holes for the main fan are not deep enough. So, I will fix this, and that will be rev 1.2. In the meantime, you can use a 1 mm to 1.5 mm drill bit and deepen the holes, if you want, or you can use 1 mm shorter screws than came stock if you prefer; though it works as it is; --just that the fan is a little bit lose even as the screws have screwed in as far as they can go. Or wait for rev 1.2; I should have out by Monday. Revision 1.2 stl uploaded. Many little details improved: Holes for main fan screws are about 1.5 mm deeper. Supports for fan grill are a little thicker. Grill for centrifugal fan shifted slightly to be better centered on the fan. Gained a few extra square millimeters of airflow space around the hot end. Fixed a couple of non-coplanar polygons and other minute visual artifacts. First item is the one that mattered because, as of rev1.1, original fan screws were hitting the end of the holes prematurely, leaving the fan a bit loose. I'm starting a verification print now (2 am Sunday June 10 2018) and going to sleep. Tomorrow I will probably upload gcode; --and just so you know, I will place the model closer to the 0,0 corner of the build table, so that people with smaller Crealitiy models can use the same gcode. UPDATE: Same Sunday, just 6am. Test print is looking good enough. Uploaded rev 1.2 gcode. Also uploaded the Blender file. Enjoy. Test print is done. It basically worked. 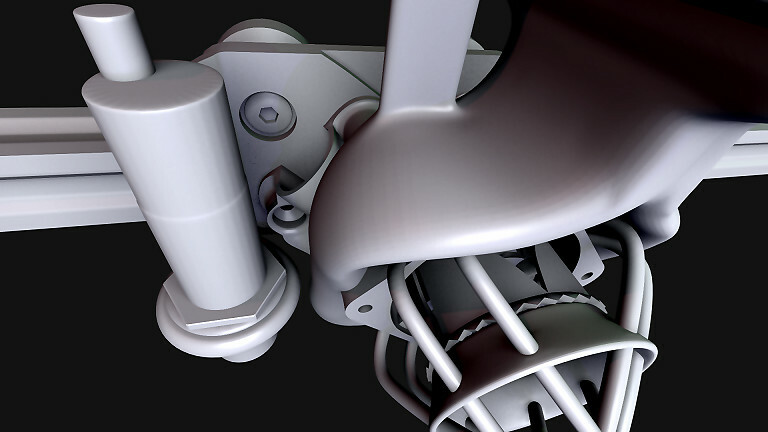 There's a minor issue remaining with the supports for the main fan grill. They kind of collapsed, but then the material managed to bridge over the collapse and still managed to make a working piece. So, I'm calling 1.2 a working revision, if not a "final" one. I'm having an idea how to improve the support under the fan grill: I think I'm going to place a thin walled cylinder, with a wide ledge at the top, supporting the fan grill ring, and gothic architecture style "doors" on the sides of this cylinder to avoid colliding with the parts of the model that cross this cylinder. This solution would be a lot more rugged than having tall and thin sticks for supports. So, this will be part of revision 1.3, but I won't work on that for a while. I have my other project to finish, the vernier, and besides, I would like to see more people making this and giving me feedback, so I can improve a whole bunch of things for rev 1.3. My test print seemed to be going very well on Saturday, but today I got to my office here, where the printer is, and found a hell of a lot of stringing on the finished print. I'm going to try to fix it and release gcode version 1.31. No change to the blend or stl files; just the gcode file will change. My anti-stringing tweaks seem to have worked negatively. I found the finished print of the rev 1.31 gcode this morning with more strings than a cobweb on Halloween. I have no idea what is going on; I thought I had the stringing issues totally conquered, and I have dozens of Z-19 prints of previous revisions all over my disk, with hardly a barb on them. I must have done something very wrong. But I won't be able to look at it tonight, so assuming I start a test print tomorrow night, and that I nail the problem, by Thursday night I should have a new gcode revision (1.32). In the meantime, there's nothing functionally wrong with the present gcode; just the fact it makes you work extra hard at cleaning it. Well, on second thought, there could be strings inside the air pipes, which is not good... Okay, never mind, better wait till Thursday, or use the stl file. I've been working hard at figuring out the stringing problem with the rev1.31 gcode. One thing I was doing wrong is having a non-zero Z lift on retraction. That is a BAD idea, as the lift causes an upward "hair" that remains sticking up a fraction of a millimeter or whatever, but on the next pass the nozzle will hit it and get dirty. This is a lesson I had learned before, but somehow forgot or dismissed, only to learn it again. Z lifts don't work. The other thing I had done wrong was a mental calculation. It is better to use a calculator. Simplify 3D allows you to specify retraction, and it also allows you to enter a number for additional extrusion length on extrusion restart (default is zero; negative numbers allowed), which is a length of extrusion added to the undoing of retraction. I never thought of touching that until I decided to use the 'coasting' parameter, which is an extrusion distance that the extruder stops BEFORE the end of a run, counting on that the material will keep oozing out of the nozzle by built-up pressure anyhow. I set this to 4 mm. My mental calculation was as follows: Nozzle diameter is 0.4, fiber diameter is 1.7, say 1.6 for simplicity, 1.6/0.4 = 4; 4^2 = 16; 4 mm / 16 = 0.25 mm. So, I entered 0.25 mm in the extra extruder length box. THAT was the main cause of my stringing problems. Fiber diameter is actually 1.75. 4mm/(1.75/0.4)^2 = 0.2 mm; NOT 0.25. Lowering that number from 0.25 to 0.20 made a dramatic difference. Not perfect, but a lot better. But the story is not finished: Picturing the extruded material as a cylinder 0.4 mm in diameter is totally incorrect, as the thickness I'm laying the material is 0.1 mm; NOT 0.4 mm. The width I have at 0.42. So the cross section of my extruded plastic is really 0.042 mm^2. The cross-section of the fiber is 1.75^2*pi/4 = 2.4 mm^2, so the extrusion ratio is that over .042 = 57.27; and 4mm/57.27 = 0.07 mm. NOT 0.25; NOT 0.2; NOT even 0.1 ... 0.07 mm. So this will be my new value to try and print. 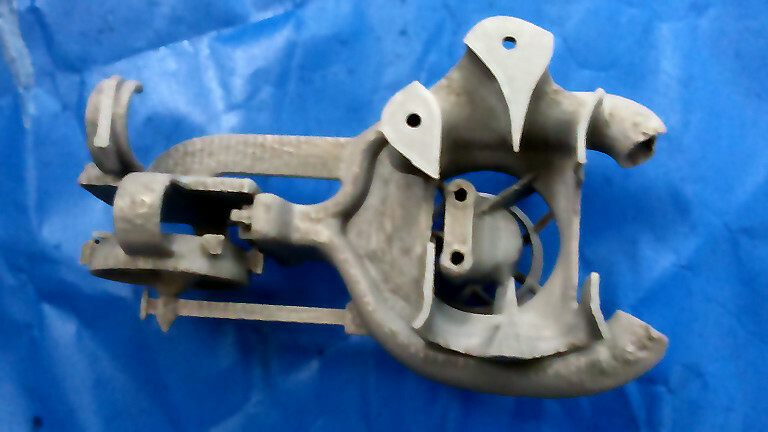 But now for the badder news, one of the designed supports broke during printing. Yesterday I broke part of the model when trying to remove the print from the table. I have some work to do. The model is not finished yet, I've come to realize. So, rather than a revision 1.32 gcode, what there will be is a revision 1.4, probably this weekend. Revision 1.4 is hours away... test-printing, looking very clean so far (I'm resisting the temptation to post it now). But the difficult part of the print comes near the end, when it gets to those wires for the fan grill, so I'd better wait. The print should be finished by noon, and if all goes well I will upload rev1.4 Friday afternoon. UPDATE (June 22, 2018): Revision 1.4 released. Enjoy! 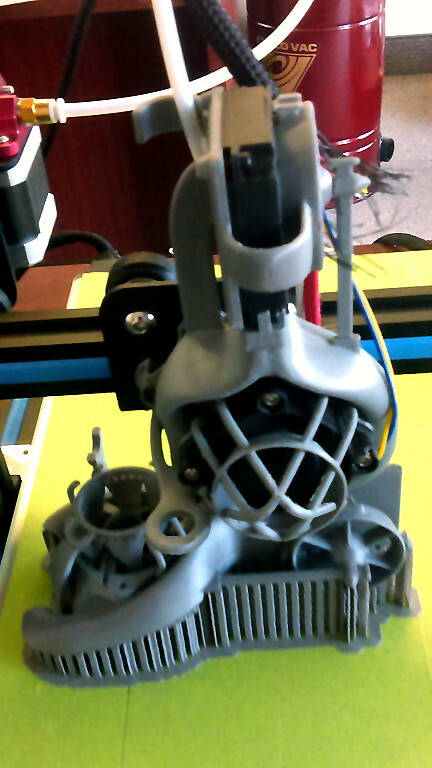 Strengthened support cylinder, to avoid the clapping noises during printing. Roof of main air duct raised by about 1 mm to reduce drag. Wires of main fan grill even further thickened. Many triangle pairs around the mesh converted to quads to improve subdivision quality. Mesh improvements, like surfaces that were meant to be flat but were not quite, now are. Right side air pipe pushed inwards a bit, made straighter. Revision 1.5 released. Hopefully this is the final revision. UPDATE (July 2nd, 2018): Revision 1.5 printing test passed with flying colors. No problems at all. This is a go as is. ANNOUNCEMENT: There will be a revision 1.6 coming out soon, sometime in August, featuring TH3D's 12mm EZABL auto-leveling sensor compatibility. Which means, in other words, that the round thing on the left side is going to change size and location. Besides that, I'm planning to make some little features a little bigger, namely the "feet" that try to separate the top fan grill from the fan, which feet broke on me on my last printing. Worked without them; but it should be fixed. See the section "Preview of revision 1.6" at the bottom of the page. Pictures of work in progress. Addded a blender file of current 1.6 development; it is named "Z-19-rev1.6-preview1.blend". UPDATE (August 16, 2018): I have so far test-printed the rev 1.6 brackets for bed leveling sensors; but I have not yet printed the Z-19 rev 1.6 itself. I was going to make an attempt tonight, but then I discovered a problem of (still) insufficient thickness of the fan grill wires, so I worked on that, and saved a new preview stl file, which I'm calling "rev 1.599". I'm uploading it for dare-devils only; if you're not one, wait for the official rev 1.6, which might materialize this weekend; or print rev 1.5, which is perfectly fine except for lack of bed level sensor support. There's a "rev1.6-preview2" blend file for curious blenderheads. UPDATE (Late night, August 17, 2018): The last test print I mentioned this morning failed. Supports started coming off the raft during printing. I modified one Simplify3D process parameter and it seems to have made all the difference. Vertical space to the raft surface was 0.14 mm by default. The mousover tip said that increasing the distance makes supports easier to remove. So I reduced the distance to 0.1 mm, and voila! No problems so far; it's at 10%, so, another 29 hours to go... By the way, one tweak I found that finally got rid of the last remaining hairs was to specify an extrusion width thinner than the nozzle itself. My nozzle is 0.4 mm. Extrusion width, if I check the Auto box, goes to 0.48 mm. 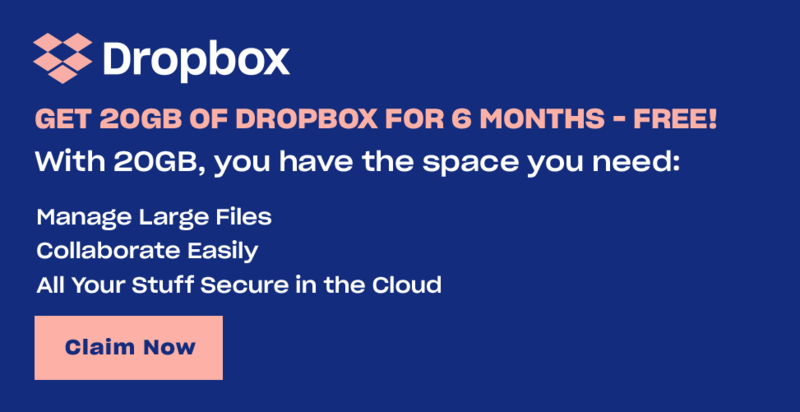 So, by default Simplify wants to push more goo and print less lines. I manually entered 0.38 mm for this parameter. What that means is that material will flow reluctantly, but more lines will be printed in the same space. But that's what I wanted. I wanted to extrude minimally, to reduce oozing. But if I were to just put flow control down to 90%, there would be space between lines, and less strength. By reducing line width, instead, Simplify compensates by putting the lines closer together. UPDATE (August 18, 2018): I had my slow (33-hour) print of the Z-19 rev 1.6 in PETG coming along nicely at about 30% last night, and I went to sleep. This morning I rushed to check the progress, and found the printer dead. :-( The computer was at the fresh boot log-in prompt, so obviously there was a black-out overnight. I'd start a new print now, but I'd better not... Thing is, this weekend there was supposed to be hydro work in this area (we got a notice 2 weeks ago), and there is no water right now, in fact. What I didn't realize was the danger that they might need to mess with the electrical grid; but now I do, in hindsight. So, I could start another print now, only for it to fail due to yet another blackout today, or tomorrow. So, I will wait until Monday to start a new print. The good news is that the print was coming out great so far. I'm almost tempted to release 1.6 without full confirmation; but nah... I'd better not. Also overnight, justuk reported a problem with the 1.6 brackets; the hole for the wheel screw is in the wrong place by about a millimeter and a half; so I will be updating that file in the next hour, before I go home. UPDATE (August 19, 2018): 82% done, and coming along nicely. However, the toughest part remains: The new and longer vertical wires of the enlarged fan grill are about 1/2 way printed. Will they survive all the way up to rejoining at the ring? That's the question. And the 18% remaining represents four more hours, and I can't stay here 4 hours; got to go back home and do a load of laundry before the laundromat closes. The printout is quite "hairless" considering this is hairy PETG, so I'm uploading the PETG fff file so that other humans with PETG and Simplify3D may benefit. The file is named "CR10-PETG-0.1mm_for_Z-19.fff.zip". Main fan grill enlarged to be able to fit a 40x40x20 mm muffin fan (as well as the original 40x40x10 mm muffin fan). Mounting base at the back and on the left side "raised" by 2 mm to allow various custom brackets for auto bed-leveling sensors to mount onto the back plate and use the same screws. Revision 1.61 is finally out!!! The test print came out fairly okay; the long fan grill wires survived, all 6 of them, and closed to the ring. 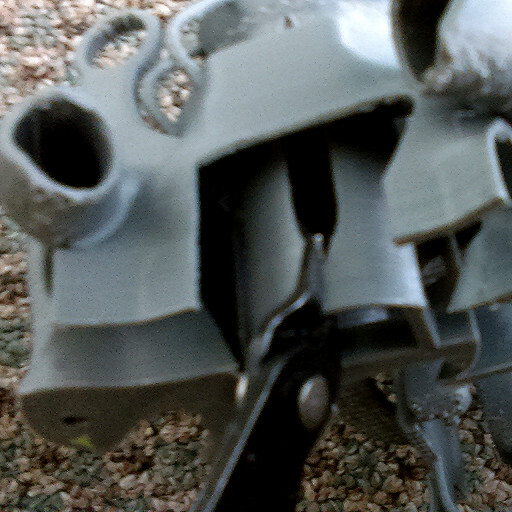 The little U-shaped loop of wire atop the very long support; it broke off. But that's because of an error in the design which I knew was there but didn't want to stop the print for it; and I've fixed it in the new stl file. The other problem is that the very thin walls of the rectangular tube that inserts in the top fan's outlet simply did not print. Looking at the process window in Simplify3D showed the same thing; --absent walls. A bit of investigation turned out that it was the coasting distance that was taking them out. I reduced coasting distance from 4.2 mm to 2.4 mm (and restart distance from 0.07 to 0.04mm), and the walls reappeared. As an extra benefit, after reducing coasting distance, in-fill began to show inside the fan grill wires. But so, since the problems are so few and so well resolved, I feel confident enough to release this version without waiting for yet another test print. I am releasing also a gcode file for PETG. I do not have PLA at the moment, so I could not verify a PLA gcode. Hopefully I'll be able to uploade gcode for PLA in a week or so. For now, what you could do is start a print of the gcode for PETG, and as it starts override the nozzle temperature down from 242C to about 205C. UPDATE AUGUST 20 2018 (at least in Europe it is; here it's 10:20pm Aug 19, but never mind...): Urgent change and re-release as rev 1.7. I was cleaning up the test print and had so much trouble removing the manually designed supports that I broke one of the wires in the fan grill, so I desperately worked to fix the problem. 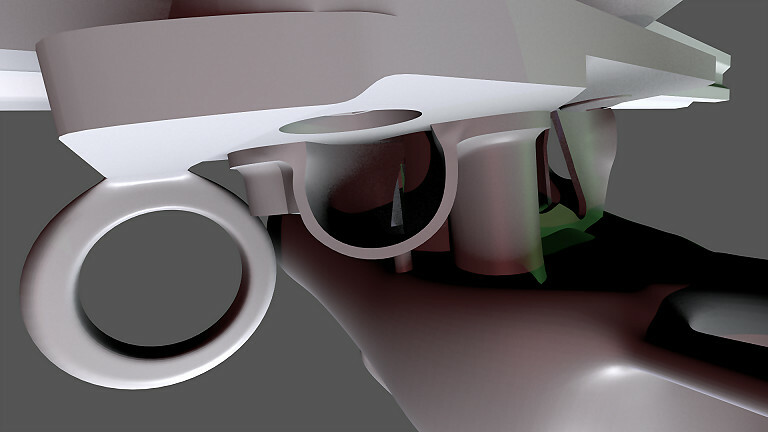 1.7 differs from 1.61 in that cuts are added to the cylindrical, internal support, to make it easier to cut and remove. I also found ways to thicken the fan grill wires yet again. Another 1/2 mm or so. I have to go home and sleep now, so no gcode for 1.7. I will remove gcode for 1.61 as it should not be made. The ABL brackets STL revision 1.61, that one is okay. 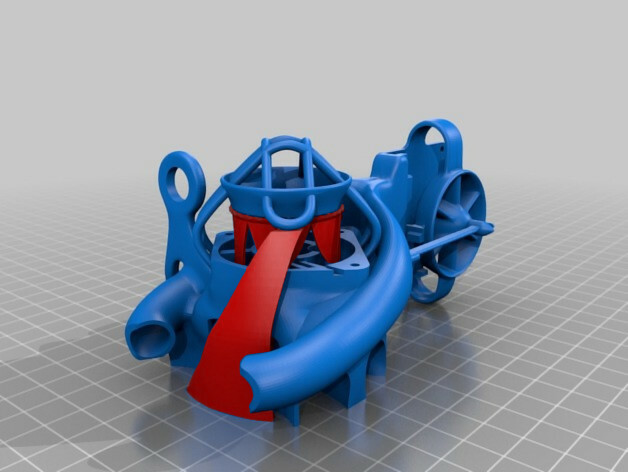 UPDATE LATE AUGUST 20 2018: Rev 1.7 gcode files added; one for PETG, and one for PLA+. The PLA+ should work for PLA; nozzle temp is 210; usually for regular PLA I'd use 205. No big difference. The big difference is times. The PLA gcode is about 24 hours; the PETG is more like 33 hours. That's because PETG likes to print slowly. Can't test the PLA file right now, as I don't have PLA, but it should work. And there's no gcode for the brackets yet; but those are easy to slice. UPDATE EARLY AUGUST 22, 2018: Fixed problem with BLtouch bracket (screw-holes were too small; thanks to justuk for the feedback; they are now 3 mm diameter). 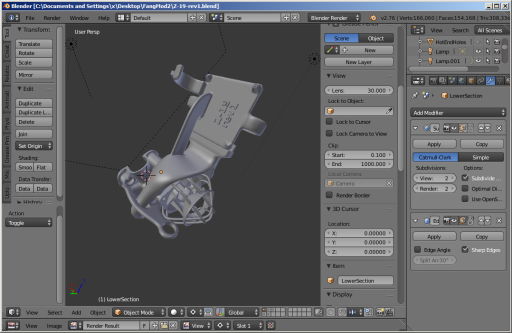 Also, separated all four brackets, each being a separate STL file, and having revision number 1.7. Updated Blender (.blend) file, but with same revision number, same filename, since it was already at 1.7 for the Z-19's sake. Extreme Left: First version, had to break it to pull it off as a mounting screw got head-stripped. Center: a post-apocalyptic, "Fallout" version. Right: revision 1.1. The wires of the main fan grill are now thick enough to... --no, not to get in-fill; they'd have to be a lot thicker for that-- thick enough to get inner and outer perimeters, as opposed to a single perimeter; so they are a lot less brittle now. The circular ring in the main fan grill had a mysterious problem of adhesion to my manually designed cylindrical support structure under it. I kept pushing them closer together (ring and support), until they were grossly interpenetrating, and still Simplify3D was interspersing 3 layers of nothingness between them. Seems to be some kind of policy. So, what I did to defeat this Simplify policy was to boolean union (solder together) the support structure and the ring. This represented many, many hours of work, as boolean operations to this day continue to be horrendously dumb and inefficient, so it takes ridiculous amounts of work to clean up all the profusion of vertices and little triangles they gratuitously generate. But finally it works! On the top fan grill, the spokes and ring are both a bit thicker and stronger, but more importantly the fan grill is held by about 4 new clusters of support material. 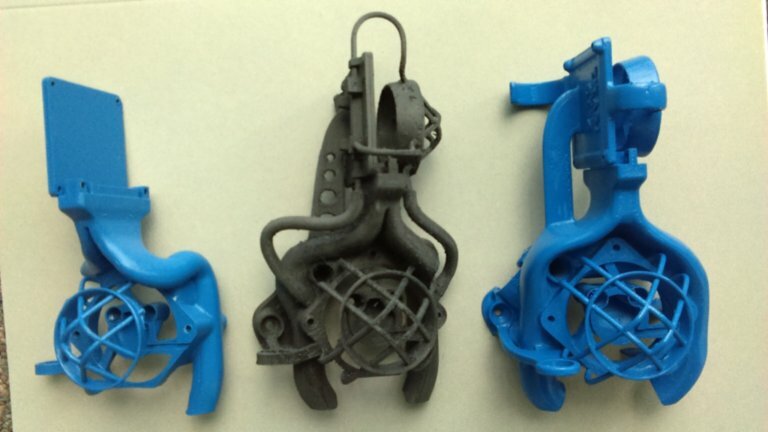 When things break during printing it is usually not because they are "not strong enough" exactly, but rather because of flimsy support that allows them to tilt, and therefore get on the way of nozzle movements. Also on the top fan grill, no less than five structures now rest against the fan, pushing the grill itself 0.5 mm away from the fan blades. A perimeter around the fan end of the air ducts was fattened up to strengthen that intake, so that a crack never happens again. Holder for bed-leveling probe made larger in diameter and a bit thicker. Lower-left air exit wall hitting the lower wheel screw, I moved it up another mm and I'm crossing my fingers and toes. I've had two reports already on it breaking or needing to be cut off, but this is like my 5th time swapping Z-19's in my CR-10S and I never had that wall break on me. In fact, it was badly bent, but I had never noticed before spymaxx reported the problem with a picture. When installing, I always pushed the Z-19 flat against the back plate, then jiggled it vertically and sidways until the screws went in, and called it a day... Am I Neanderthal? Anyways, I moved that wall up by another mm, and I'll try it (revision 1.5 is actually test-printing as I write this; I feel confident enough to publish it because yesterday I printed revision 1.45, which was a close stepping stone to 1.5). 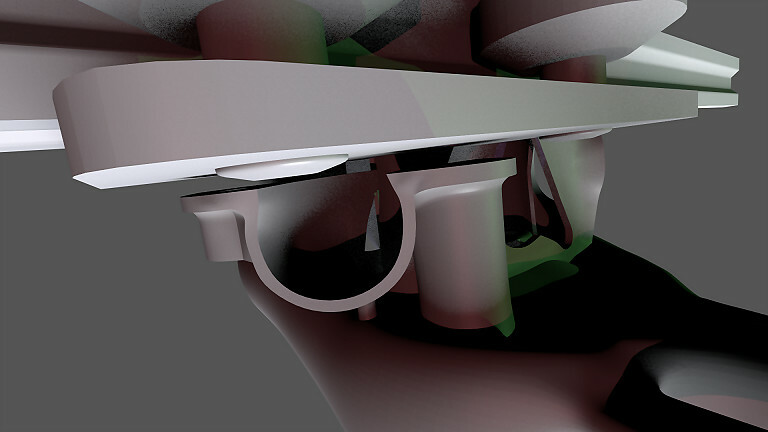 New gcode is smoother than before; you won't be able to see a polygon on any curved surfaces. For previous gcodes I used the same stl file that I upload, which applies my normal subdivision setting of 2 (about 16 x polygons). This time, I'm stil uploading the stl at level 2 subdivision; but I exported another stl at subdivision level 3 (64x polygons) for gcode generation. I won't upload this stl; the file is 73 megs! But the provided gcode is generated from it, and therefore ultra-smooth. Infill was 50% in revision 1.4; it is now back to 100%, as it was originally. The new gcode also prints faster. Cut down printing time from 14 hours to 11. So, that's it. This is the FINAL version... (hopefully). My next project will be a Z-X, using better fans; but it will not be a revision of the Z-19; it will be a separate Thing called "Z-X". I've already ordered four samples of fans from Digikey... So work is about to start on it in a few days. Notes on revision 1.4 (June 22, 2018): Brim reduced to 5 perimeters. The "wires" that make up the fan grill are about 20% thicker now (which may still not be strong enough... we shall see). The support for the U wire in the main fan's grill has been redesigned --it was made of little 'sticks'; now it is like a thick, curved wall, super-strong, and it even connects to the cylindrical support structure inside the main air duct, for mutual support. The U-shaped things that hold the upper fan's grill got wider by 20%. 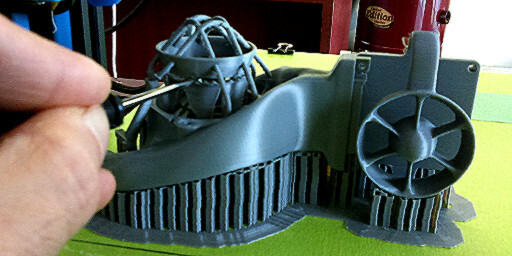 That fan grill acquired two mysterious looking squarish features above and below, their purpose being to get supports generated by the slicer, to reduce the wobbling of the grill as it prints. The holder for a bed leveling probe got a bit bigger and stronger, and moved slightly away from the fan grill. The ring in the main fan grill was made to intrude into the cylindrical support below it, by about 0.1 mm, to improve adhesion. Last but not least, the gcode is highly optimized to get rid of "hairs" in the print. VERY clean print; I'm very proud of the parameter optimization journey, and I would encourage you to use the gcode provided, if at all possible. 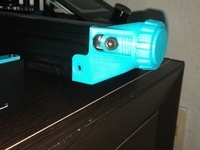 It is targeted to PLA (60C for the bed, 205C for nozzle, fan speed 100%), but you can use it for other materials; all you have to do is override the bed and nozzle temperatures through the control panel after the printer starts; and/or override the fan speed after layer 3 starts (which is where I crank the fan speed to 100%). For example, for PLA+ you'd lower bed temp to 40C and raise nozzle temp to 215C. For ABS you'd cut fan speed to zero, besides readjusting temps. I will edit the post-print instructions tomorrow, as the print takes 14 and a half hours, anyways, and right now I'm starving... Enjoy! Other changes: A small structural support column under the left air duct added. Main fan cover's ring re-meshed more neatly. Small improvements to air flow around hot end. Improved the gcode by reducing retraction from 6 mm (excessive) down to 4 mm and increasing coasting from 1 mm to 3 mm, instead. (That's the distance of nozzle travel before the end of a continuous run at which the extruder stops, --and lets material pour out of built up pressure.) Seems to work much better than doing an epic retraction. The coasting is compensated by an extra 0.2 mm (raw fiber) extrusion boost after retractions. Note on revision 1.2: Many little details improved: Holes for main fan screws are about 1.5 mm deeper. Supports for fan grill are a little thicker. Grill for centrifugal fan shifted slightly to be better centered on the fan. Gained a few extra square millimeters of airflow space around the hot end. Fixed a couple of non-coplanar polygons and other minute visual artifacts. First item is the one that mattered because, as of rev1.1, original fan screws were hitting the end of the holes prematurely, leaving the fan a bit loose. Note on revision 1.1: All that has changed from revision 1.0 is I added a bit of ribbing on the back of the square piece the centrifugal fan attaches to, for reinforcement, as that piece split in half on me, on my second-last printout. I also made the "wires" that make the main fan grill a little thicker at the end where they come out of the base, so they don't crack so easily when cleaning. Thanks to Dreylok (https://www.thingiverse.com/Dreylok/about) for the idea of standardizing a separate mount that can then be modded for the various sensor types and sizes. Revision 1.6 will be coming out soon, with such a mount and 4 holders. Here the new bracket (for EZABL 18 mm) is inserted between plate and Z-19. Here we see the new bracket dutifully holding an 18 mm sensor. Unobstructed view of the bracket. There will be another bracket for EZABL 12 mm. There will be yet another bracket for BL-TOUCH. And there will be a dummy bracket to fill the 2 mm space when no sensor is used. All these brackets will be added to the gcode.  Say thanks by giving Dan_W_58 a tip and help them continue to share amazing Things with the Thingiverse community. We're sure Dan_W_58 would love a Tip, but unfortunately they have not setup their accounts to receive them yet.